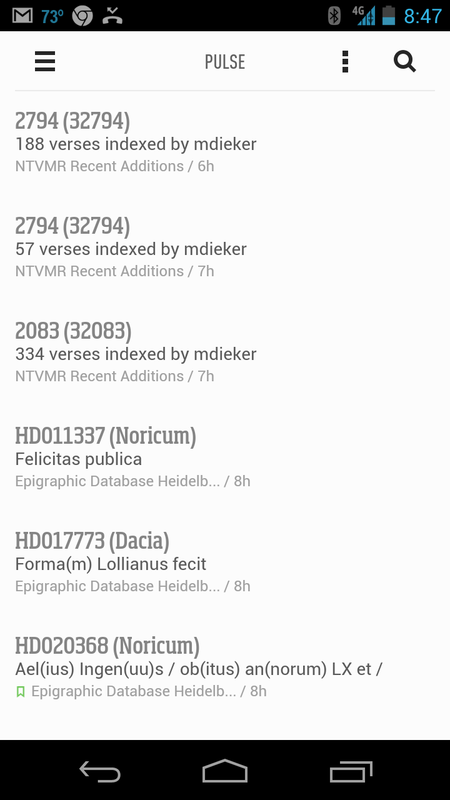 I've just added John Muccigrosso's Vicus Martis Tudertium to Maia and Electra, and Robert Consoli's P_Redesign_Deficiencies to Electra. A couple of hours ago, I was sitting out on the back deck with my wife and pets, enjoying perfect temperatures, morning birdsong, lavender-scented country air, and a cup of freshly brewed Costa Rican coffee (roasted by the good folks at the Kaffeeklatsch in Huntsville). Idyllic. Forma[m] Lollianus fecit?!? I'm predisposed by my dissertation experience to trigger on certain Latin and Greek words because of their sometime significance for the study of Roman geography. Forma is of course one of those words, and it does (probably more often than justified) get translated as "map" or "plan." Could this be — admittedly against the odds —an inscription on a map or plan drafted or surveyed by some guy named Lollianus? If you're me, the possibility warrants a click-through to a corresponding record in the Heidelberg Epigraphic Databank (EDH). My mappish hopes were quickly dashed, but just as quickly were replaced by interest in a group of inscribed objects I hadn't run across before: mirrors from Roman Dacia bearing makers' inscriptions. "Forma" can mean "mirror"? A quick check of Lewis & Short at Perseus doesn't support that idea, but builds confidence in a better interpretation: "mold, stamp, form". Was this mirror, or some part of it, somehow cast or stamped out? The EDH entry tells me there are 9 identical mirrors extant and that the inscription goes around the "Fassung" (frame?). Yup. Cool. I learned something today before breakfast. And it's knowledge I can use when I come back to doing more with the geographical/mapping/surveying vocabulary. And then it hits me: that's not information I went looking for, not a search I initiated. New information of interest was pushed to me because I had previously used a software tool to express interest in a number of information sources including, but not limited to, ancient inscriptions. The software kept an eye on new output from those sources and made it available to me for review and engagement in a mode and at a time and place of my choosing. And because the source data was online, open, and linked in a standard format, I was able to drink coffee and pet my dog on the back deck in Moontown, Alabama while making use of the scholarly work done yesterday(!) by Brigitte Gräf in Heidelberg, Germany. Isn't this one of the things we've been working toward? Sometime earlier this year, Frank Grieshaber in Heidelberg rolled out web page listings and corresponding Atom feeds of recently changed content in the EDH (e.g., latest updates to the inscriptions database). I added them, along with similar data-oriented feeds, to a feed aggregator I dubbed Planet Potamos (with "Potamos" trying lamely to evoke a rushing river of data; the "Planet" acknowledges the feed aggregation software I use). I put the same feed subscriptions into my personal feed reader (I could also have put the Potamos aggregator's feed, but it only updates periodically and I'm an immediacy junkie). I installed and configured my feed reader on every device I use. The rest is magic. Magic made the old-fashioned way by lots of people in many different places and times developing standards, building software, creating data, doing research, and sharing. Well, I hope that Frank and his colleagues in Heidelberg will eventually add thumbnail images (where they have them) to the EDH feeds. I hope that the other epigraphic databases (and indeed all kinds of ancient studies web applications) will set up similar feeds. I hope that we can all start using more linked-data approaches in and alongside such feeds in order to communicate seminal interpretive/discovery facets (like geography, personography, temporality and genre) in machine-actionable ways. I hope the spirit and practice of openness that lubricates and accelerates this sort of synergy continues to grow and flower. I have added Trafficking Culture to the Maia Atlantis feed aggregator and the Tessarae Project Blog to both Maia and Electra. New Feature on "About Roman Emperors"
As readers of this blog will know, the About Roman Emperors dataset is built upon the backbone of Wikipedia. 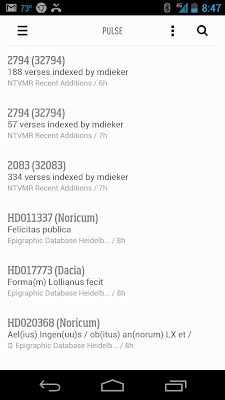 More specifically, HTTP URIs like http://dbpedia.org/resource/Nero are programmatically created by the dbpedia project on the basis of Wikipedia content, and I used them to identify uniquely each emperor. Web pages and other resources about those emperors are then linked -- using FOAF and other vocabularies -- with those identifiers. These little packages of data about the emperors and their web pages are serialized in both HTML and RDF form on my website.